When I saw Cooking Light’s March feature about open-faced sandwiches, the photo of the eggplant sandwich stuck in my head. Their version was breaded with panko and piled with marinara and mozzarella, but all I could think about was grilled eggplant with our summer tomatoes and the big batches of basil pesto we make in July and August. I’ve had this sandwich on the brain for a few months. 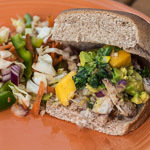 Sandwich nights are huge timesavers for us, like any busy family, and during the summer we’ll do sandwiches or dinner salads for many weeknight meals. 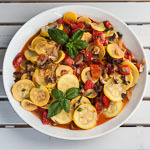 This meal is great for the kids to help with, because they can do the slicing and side salad preparation while the eggplant sweats, then make the toast while an adult works the grill. 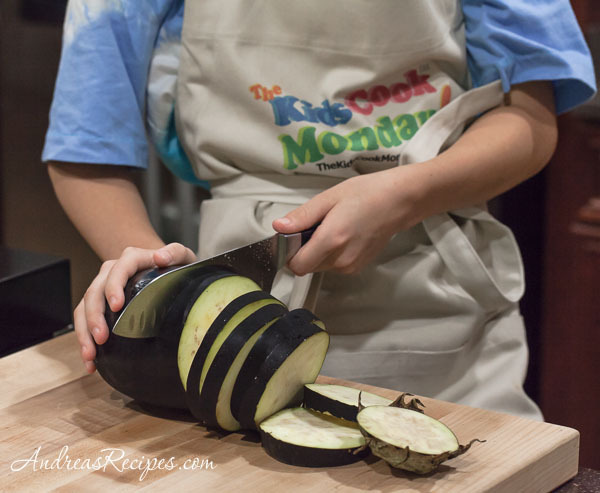 We emphasize teamwork with our boys, and making dinner is a good way to practice that. A little teamwork and it all gets done quickly. While Michael and I ate these sandwiches open-faced, my boys went for whole grain buns, and they dug in with gusto. Top Gun even asked for seconds, and all three boys asked if we could have these more often. Yes, my dears, anytime. Layer the sliced eggplant in a colander, liberally salting each layer. Set the colander over a bowl and allow the eggplant to drain for about 30 minutes. Rinse well and pat dry. 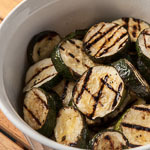 Rub olive oil all over each slice of eggplant, and grill until golden on both sides, about 3 to 4 minutes per side. Grill the tomatoes about 2 minutes on each side. Toast the bread while the tomatoes are on the grill. Lay a slice of toast on a plate and spread some pesto on it. 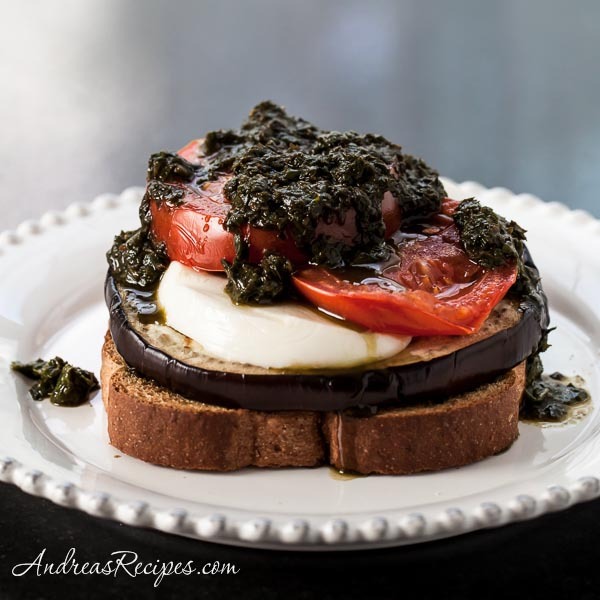 Layer on eggplant, cheese, tomatoes, and drizzle some more pesto on top. If you grow your own basil, by all means whip up a batch of pesto. You will so glad you did. But store-bought is fine, too. For sandwiches, I like my pesto to have a drizzly quality, so I add a little extra olive oil. And you can always substitute layers of fresh basil leaves for the pesto. Make sure the eggplant is shiny and blemish-free, and the tomatoes are fully ripened. Thanks Becca, your flatbread looks delicious! 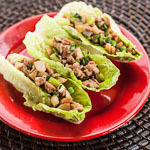 We made this for dinner and LOVED it! Thanks! It’s much richer than I expected it to be, but great! We’d never grilled eggplant before but plan to do it again soon! Thanks Elissa, so glad you like it!